This darling fella followed me all the way to class the other day. Despite most people's strong dislike for squirrels in the city I find them rather charming. They're super cute, trusting, and they're really fun to feed! (yes, I feed the squirrels sometimes...) I had fun snapping away and I would have had a lot more photos...but he didn't like staying in one place for too long. Oh, the troubles of manual focus. nice photography! who took it for you? and i love your polkadot blouse! your outfit so amazing and cute! This is so perfect, I'm dying over those pants! I love your outfit! Its so classic and chic! 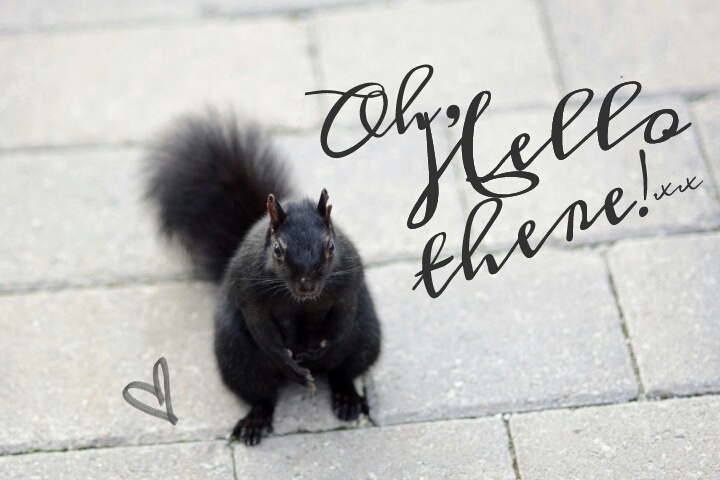 Those pants are so gorgeous, and that squirrel is so cute! Wow I completely adore this outfit & the photos are beautiful (especially the ones with squirrels!). I love monochrome so I love the look, i would have loved to see the jacket with the whole outfit! I'm in love with all things monochrome at the moment, so this outfit is gorgeous. You look like such a lady! (Now, I'm hoping this is taken the right way, you always look like a lady, but especially so here haha). This is just so classic and sophisticated, I love it! Adorable polka dot blouse and love the bowler hat. It must be a bit warmer there in Toronto, 'cause it's been rather chilly here in Ottawa! I am completely in love with the top and shoes. Beautiful and stunning pieces. Such beautiful, stylish photos! Your look is very Parisian and black and white classy! Love the polka dots and that hat! You look so cute. Beautiful pictures and outfit! I adore your heels and the heart-shaped shirt. such a darling lovely ensemble!!! i love the hat and top!! sweet look! Love this outfit, especially your hat and cute phone case! I love so much this preppy look the pants and the shoes are great! So stunning. Looove the hat. I adore your heels and shirt :) Loving the first photo it's gorgeous! Seriously, I am loving your whole outfit, from head to toe. Its gorgeous and it looks so good on you. I love this outfit. Casual and classy. Gorgeous outfit! I like it and adore it!